CINCINNATI and REDMOND, Wash., Jan. 7, 2019 /PRNewswire/ -- The Kroger Co. (NYSE: KR) and Microsoft Corp. (Nasdaq: MSFT) today announced a collaboration to redefine the customer experience using Kroger Technology products powered by Microsoft Azure, the retailer's preferred cloud platform for Retail as a Service (RaaS). Through this innovative partnership, Kroger will pilot a connected store experience and together with Microsoft, jointly market a commercial RaaS product to the industry. The RaaS product is enablement software built by a retailer for retailers, supporting modern retail experiences and harmonizing customers' digital and physical shopping experiences. The rapid transformation platform enables a retailer to prioritize its most desired initiatives. 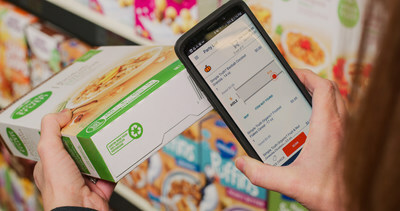 Future commercial products include: Scan, Bag, Go; Virtual Store Manager; sensor network; and connectors to corporate systems like point-of-sale, and inventory management, tag and merchandising systems. Microsoft and Kroger will jointly bring the RaaS solution to market. The first RaaS product offerings, EDGE Shelf, guided shopping, personalized ads and pick-to-light, will be available to view at the NRF 2019: Retail's Big Show in New York in the Microsoft booth (#3301). Mr. McMullen will deliver a keynote at the event, sharing details about the partnership and providing his outlook on the grocery retail industry, at 9:45 a.m. EST on January 13.